recognize and define the parameters of a project. We learned why and when we should be alert for scope creep. 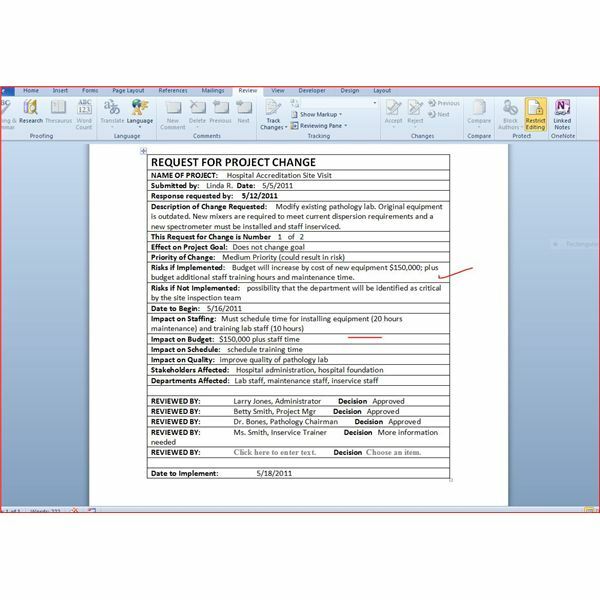 In this article, you will find a free, downloadable form–a Word doc–that you can complete whenever you realize that you must request a change in your project. 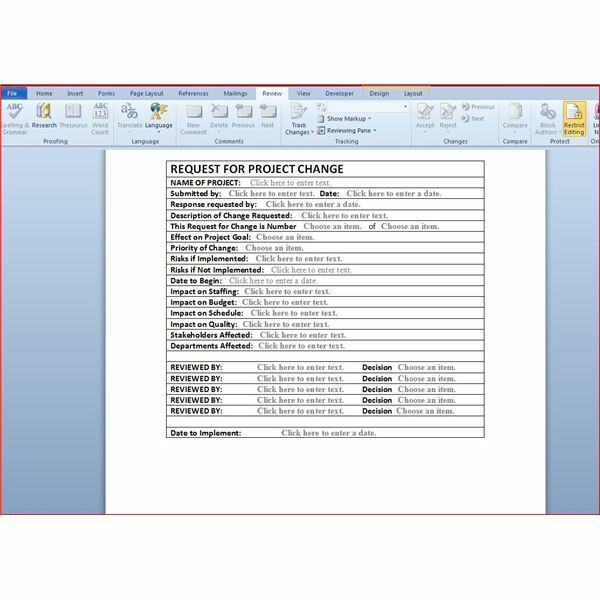 Utilizing this Request Project Change form will help you identify what you want to change in a way that coordinates efforts among all stakeholders and project team participants. Identifying who will be affected. Identifying changes in the project schedule. Assessing the potential for risk. Considering any change in the end quality of the product or service you're working on. Pinpointing any other departments affected or other phases of the project that are affected. The form contains fields where you can enter text or choose options. It is protected but not with a password; if you want to alter it for your own needs, choose the Review Tab, and in the Protect Group you will select Restrict Editing. Then you can go to the Home tab, look for the Editing tab on the far right, choose Select, and then Select All. Go to the Developer Tab, and in the Controls Group you will Select Group and then Ungroup. When you're done with the form (inserting a row so that you can add your company logo, perhaps) you can reverse these instructions. As you move through the form, you will first identify the name of the project, and then on the next line (just click where it says) type in your name. You will choose the date when you're submitting your request for change and the date when you would like to have approvals in line. Next, you should describe the change you are requesting. The text field will let you type as much as you need, but keep it brief because you will enter additional information in subsequent sections. Note the image of a completed form, where I entered $150,000 for the cost of equipment; there was an appropriate space for this a few lines down in the budget section. You will also identify that this is change number X out of a total of X changes. If you're using Microsoft Project, this is a good time to set a baseline. change the goal? Not change it at all? Impact a subphase of the project? For example, if your project is to prepare for a site visit by the federal agency that regulates your business, the end goal to be ready for the visit does not change, but the subphase involving the maintenance team comes into play. For the priority, you will define if the change is urgently needed in order to avoid risk to the project. You can also choose high, medium, or low risk levels. On the next line you enter the date when you wish to implement the change. The next sections offer you places to describe the impact the change will bring to your staff, to your budget, your schedule or to the quality of the project. You will also be able to indicate stakeholders or specific departments involved in the project change. The last part of defining project scope, managing scope creep, and creating a request for project change is identifying who is reviewing and approving these changes. 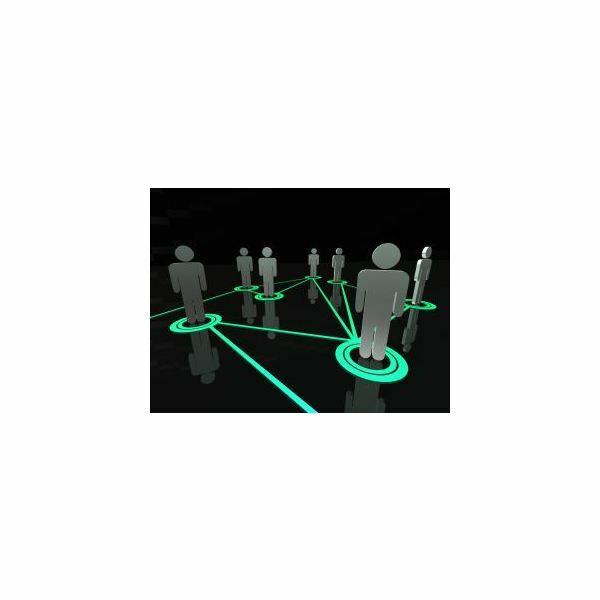 Initially you'll distribute the Request Project Change form to each stakeholder by e-mail. Each person can then enter his or her name and then indicate whether he approves, rejects or denies the request, needs to have more information, or is pending his decision. As you receive the completed forms, you can document on your original the decision of each person involved. There is also a place for the final date chosen to implement the change. You can also track changes over time to note whether most project changes at your company affect budgeting, scheduling, or some other parameter. The first phase in many project methodologies is to define the scope of the project. Natasha baker’s article explains the concept of scope creep and ow to utilize change management to control it. Article two provides change management examples and templates.